18 Awards will be on exhibit in the Sheffield Wood Gallery of The Fine Arts Center, February 5th-15th. The Fine Arts Center is located on the Wade Hampton High School campus at 102 Pine Knoll Drive in Greenville, SC. The gallery is open Monday through Friday, 8am to 3:30pm. The exhibit is free and open to the public. 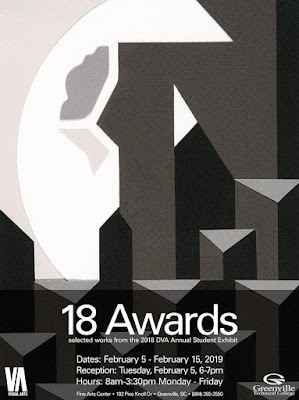 18 Awards is a unique opportunity to view challenging, thoughtful art produced by student artists from Greenville Technical College's Department of Visual Arts (DVA). These award-winning student artists were selected from the DVA Annual Student Exhibit to receive cash awards totaling $1,700 with recognition at the DVA's annual Halloween Gala. The Fine Arts Center has graciously provided the DVA this opportunity to again acknowledge the craft and dedication of these outstanding students in an additional venue. The DVA Annual Student Exhibit at Greenville Technical College is a juried competition. During October 2018, 51 students committed the time and resources to enter 154 works in the competition. Juror David Detrich, Professor of Art at Clemson University, chose 48 works by 34 individual students to include in the exhibit. From those 48, Detrich chose 18 Awards, representing all the art disciplines included in the DVA curriculum. According to Detrich, "Work of this high caliber makes visible the quality of committed art instruction available at Greenville Tech's Benson Campus." The exhibition speaks to the success of the Department of Visual Arts in producing successful employees and transfer students. Detrich awarded Best in Show to Ethan Stroud's poignant photograph, Grief Prevails. "The success of the photograph lies in the gravity of the subject matter in relation to the human condition and the economy and precision in which it is rendered." The Department of Visual Arts at Greenville Tech offers associate degrees and certificates in art education, fine arts, graphic design, photography, and web design. The DVA's artist/educators insure graduates are prepared to begin a career or continue their academic studies at regional 4-year colleges and universities. Tech's DVA grads are highly sought by local advertising firms and regional universities. 18 Awards showcases the DVA's varied courses of study; design & color, digital imagery, drawing, graphic design, painting, photography, printmaking, sculpture, and web design. "Assembled in this exhibition is an exemplary range of student artwork" reports Detrich. Any high school student interested in continuing studies in visual arts needs to see 18 Awards to discover the quality of Greenville Tech's locally available art education.